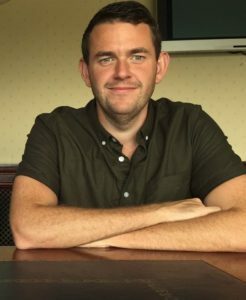 Today, we continue the updates from the Director portfolios, with David Williams providing the Fundraising Update and Mark Jones with the Governance Update. Furthermore, we would like to thank all the fans who have sold tickets themselves. This is something we need all fans to get involved with as it is one of the income streams that the club relies on. The draw for which took place last night at the Chester FC Christmas Party at the Upton British Legion. Details of winners will be published in due course. 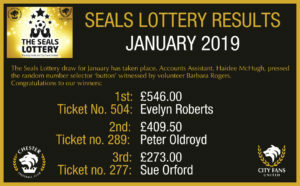 Seals Lottery – Regular publication of the draw results has seen a gradual increase in sales of Seal Lottery tickets, first prize was an impressive £542 last month. 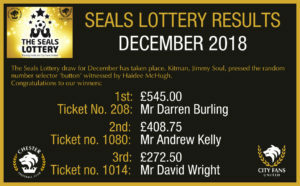 The pay out is linked to the number of entrants and we hope to grow this further in the New Year. 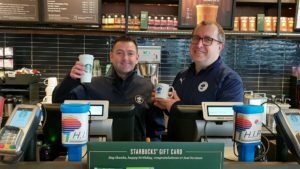 50-50 Draw – In conjunction with the Fan Engagement Working Group, we have offered half-time fan experiences out on the pitch as consolation prizes in the 50-50 draws. All being well, this will increase ticket sales and make the main cash prize even bigger! eBay – Our eBay auctions have raised circa £1,600 since they begin in February. We wish to thank all who have placed bids – we even had a winner who lives in Shanghai! We hope to offer something relating to the Akwasi Asante debut hat-trick in the near future. Health & Safety – The last few months have been very busy on the Health & Safety front with a number of planned regular safety inspections from CWAC, the FA and under the Safety of Sports Ground Act. Considerable progress has been made on a full review of our health & safety policies, risk assessments and safety certificate renewals. Safety Certificate – The flooding obviously gave us major headaches with the safety certificate, however we were successful in regaining our safety certificate from CWAC following that difficult period. Working Group – The Governance working group has attracted new members and is now meeting on a monthly basis. Each member of the Governance working group will be working alongside CFU Board members to review and manage risks within their portfolio. Tomorrow’s update will be provided Jeff Banks, whose portfolio includes Membership & Fan Engagement.